With the release of NFL 28 just around the corner, collectors will soon be able to land the first McFarlane figure of dynamic rookie Cam Newton. Since his debut, the Heisman Trophy winner from Auburn has been nothing short of dominating. Picked by the Carolina Panthers with the first choice in the 2011 NFL Draft, Newton easily won the starting job and has shown immediate returns. In the opening weekend, the athletic young quarterback racked up an NFL-record 422 yards passing with two touchdowns. No rookie had ever thrown for that many yards in his first NFL start. McFarlane has a long tradition of including one rookie per release and Newton's quick start makes him a no-brainer. 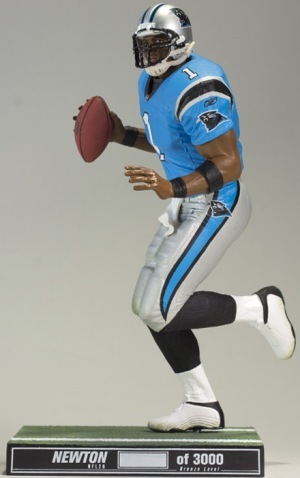 The figure depicts him in the Panthers' baby blue home uniform, on the run, looking for an open receiver. It's a classic Newton pose. The remaining McFarlane Sportspicks NFL 28 lineup consists of Clay Matthews, Ben Roethlisberger, Dez Bryant, Drew Brees, Michael Vick, Andre Johnson and Barry Sanders. NFL 28 is scheduled to release in early November. CAM NEWTON 2011 Topps Supreme Rookies 8-Piece Relics Jersey Booklet RC Card 25!